If you would have told me that I’d be sandwiched between two friends in a packed theater—gripping their hands as we alternated between sobbing and laughing—at a 9 p.m. showing of Disney’s new live action Beauty and the Beast on opening weekend, I probably wouldn’t have believed you. Turns out, however, that nostalgia is a helluva drug. Much has been made of the identity politics and dated gender dynamics of the Beauty and the Beast story: Could a story about woman imprisoned by a dog-man that she ultimately falls in love with find a place in 2017? What if Disney threw in a gay character to keep the liberals happy? Would it work then? Turns out, shallow as it may be, all of those questions were forgotten as I heard the familiar opening bars of composer Alan Menken’s haunting score. Problematic as many of them are, films from the Disney Renaissance (the era between 1989 and 1999, wherein the studio’s animated films experienced a resurgence of success) have the ability to make those of us who grew up during it feel (maybe only slightly) like kids again. There’s a reason why the Disney quizzes and content peddled by sites like Buzzfeed do so well traffic-wise—we’re obsessed with our own childhoods. Maybe it’s because we’re the last generation to grow up pre-internet age and remember a time when going to the movie theater or video rental store felt like a real event. Or maybe we’re just annoying. Probably a little bit of both. But to get the politics out of the way: 2017's Beauty and the Beast tries very hard to woke-ify the unwokable. This fairy tale, like almost all fairy tales, is rooted in a fucked up story. This one happens to be about a woman falling in love with her captor, and that is inescapable. Still, though, they try. Belle (Emma Watson) is strong-willed, loyal, and resourceful. Because the girls in her quiet village are not allowed to go to school, she takes it upon herself to teach them to read. She yearns for something bigger—adventure in the great wide somewhere, perhaps—and the Beast, with his castle full of talking furniture, gives her exactly that. Besides, the film posits, she was already imprisoned by the social mores of her town, so, really, aren’t we all in prison when you think about it? Despite the filmmakers’ efforts, this tale—old as time—remains intrinsically fucked up, but—then again—so does human desire. In general, people love “opposites attract” stories where the romantic leads begin as adversaries, then grow to love each other in spite, or maybe because, of their differences. I dunno, man. Talk to your kids. Tell them that, despite what movies tell you, unkindness shouldn’t be rewarded with affection and no person who tries to hurt them is worthy of their love (even if he happens to be a handsome dog with a talking candlestick). Then let them enjoy “Be Our Guest,” so everyone can be happy. Speaking of happiness, can we talk about the fun stuff please? Because there was so much of it. Everyone on camera seemed to be having the time of their lives and their joy was contagious. To quote my co-worker Kelly Faircloth, everyone, from director Bill Condon to the most minor of background actors, “threw themselves into it with the enthusiasm of adults planning a first-birthday party ‘for the kids.’” No one is this more true for than Luke Evans, whose portrayal of vain, brutish Gaston was so freaking delightful that I can’t stop thinking about it. Josh Gad’s LeFou provides many of the film’s laughs and its “exclusively gay moment,” all with surprising moral complexity for a children’s movie. Audra McDonald (Madame Garderobe), Emma Thompson (Mrs. Potts), and Ian McKellen (Cogsworth) shine as the enchanted objects, while Ewan McGregor as Lumiere has such a distractingly bad French accent (and McGregor’s married to a French woman, for Christ’s sake!) that it almost ruins it... though not quite! Perhaps this is where Beauty and the Beast will always redeem itself. While Belle and the Beast own the title, the film itself is driven by the ensemble. 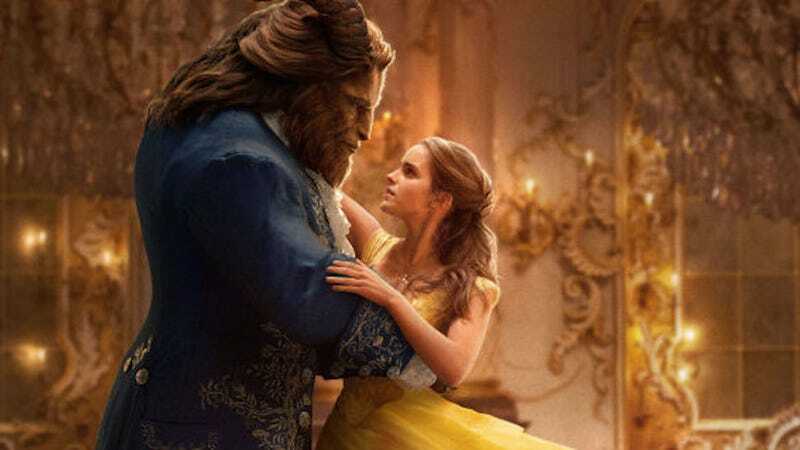 Lucky, considering that the titular characters are kind of boring (both in the cartoon and live-action version) and, while Dan Stevens displays fairly impressive singing prowess as the Beast, Emma Watson is only a decent singer. Don’t get me wrong—she would be the best actress and vocalist in my college theater program (a very good program!) and I would hate and envy her for it, but as is the case with most modern movie musicals, she does not have the training and experience necessary to blow us out of the water with this overwrought of a score. Still, though, she and Stevens (who even gets to show off some beefy beast chest at one point) are adequately charming together. As for the new songs, they’re mostly included to further humanize the Beast and fill in the backstory of Belle’s father Maurice (Kevin Kline) and are a great opportunity for the bathroom break you’ll need because you (not me) smuggled wine into the theater and you really have to pee.